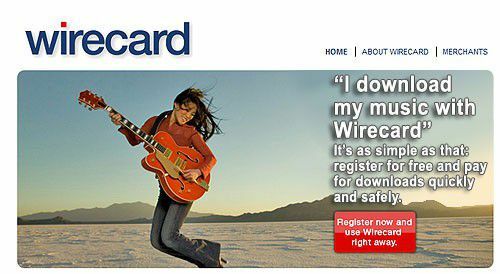 Start by going to //www.mywirecard.com/. If you have trouble depositing with your personal Visa/MasterCard and want an option just the same, then why not try Wirecard! Wirecard allows you to send and receive money worldwide in real time. It's known as a virtual Mastercard that allows you to purchase at millions of internet venders worldwide. 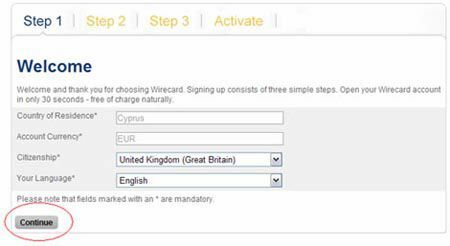 It takes around 30 seconds to open a Wirecard account, so you can deposit in EuroMania.com in no time! Once you are ready please click on "Register Now and use Wirecard right away". Start by filling in your details of your country, currency and language, then select the "Continue" button. You will then need to fill the following fields with truthful and correct knowledge. Your telephone number is the only way that you will receive your activation code, so again this needs to be correct. Your country dialing code will already be in place +357, so all you need to add is you area dialing code (drop the beginning 0) and telephone number. For example if your number is 01628-543533 then you will need to write +3571628543533. From here you will need to enable security for your account and agree to the terms and conditions/data protection. Make sure that you read all information, fill in correct details and select "Continue" once completed. We now come to the activation process page. You will need to enter the activation code which was sent to your mobile phone number via a text message. If you haven't received the code then you may select the "I received no activation code" button and try again. Or if you see that your phone number is wrong there is the option to change this. Once you have received the code just press the "Activate" button. Your account has now been activated so you may begin depositing with your credit card. 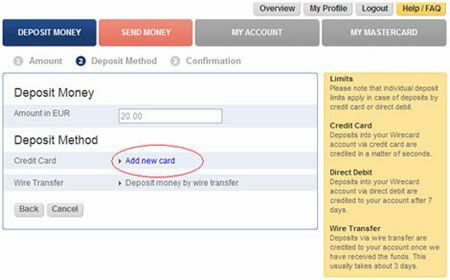 Select the "Deposit Money" option to fund your account. Next enter the amount you wish to deposit. Please keep in mind that the minimum deposit at EuroMania.com is $20 so the conversion rate will need to be taken into consideration. Then press the "Continue" Button. Select "Add new card" in order to add your credit card. Select the type of card you are using and fill in your credit card details. Once all the details are filed in press the "Continue" button. 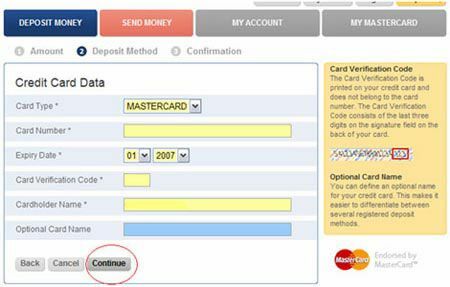 Once you have deposited successfully, you will then see the confirmation screen. In order to view your virtual MasterCard information, you will need to select the "My MasterCard" button. This screen gives you all the information you will need to deposit in EuroMania.com. If you select the small arrow next to your MasterCard number it will give your verification code and expiry date of your Wirecard.